Scollan K., Salinardi B., Bulmer B.J., Sisson D.D. Anomalous left-to-right shunting communication between the ascending aorta and right pulmonary artery in a dog // J Vet Cardiol. 2011 Jun;13(2):147-52. Anomalies of conotruncal septation are rare in dogs and uncommon in humans. Congenital conotruncal defects most commonly reported in veterinary medicine include aorto-pulmonary window and persistent truncus arteriosus. We report a case of an anomalousvessel connecting the ascending aorta to the right pulmonary artery causing left-to-right shunting, left-sided volume overload, and pulmonary overcirculation. 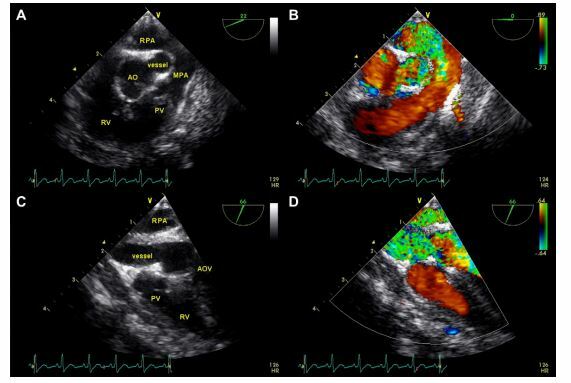 Transesophageal echocardiography, cardiac catheterization, and contrast-enhanced computed tomography assisted in the diagnosis and facilitated the surgical correction of the anomalous vessel. The authors hypothesize this defect represents an unusual anomalous vessel connecting the ascending aorta to the right pulmonary artery. A 14-week-old, female, intact miniature pinscher was referred to the Oregon State University (OSU) College of Veterinary Medicine for further evaluation of a left-to-right cardiovascular shunt. The dog initially presented to the local veterinarian at 8 weeks of age for a history of lethargy and failure to thrive. A grade II/VI cardiac murmur was auscultated on physical examination. Chest radiographs revealed cardiomegaly with left ventricular and left atrial enlargement and pulmonary vascular overcirculation. The patient was referred to a veterinary cardiologist for further evaluation. Echocardiograms performed with and without sedation showed turbulent flow within the pulmonary artery throughout the cardiac cycle. A left-to-right patent ductus arteriosus (PDA) was suspected, but due to turbulent flow identified in the ascending aorta, not typical of a left-to-right PDA, additional differentials were considered. Left ventricular size and function were within normal limits. The left coronary cusp of the ascending aorta was noted as abnormal and the patient was referred to the OSU Cardiology service for further evaluation. On presentation to OSU the patient was thin with a BCS of 2/5 and weighed 2 kg. A grade IV/VI left basilar continuous murmur was auscultated on physical examination. The femoral pulses were strong and synchronous, and lung sounds were within normal limits in all fields. The patient was bright, alert, and nervous. Heart rate (160 bpm), respiratory rate (40 breaths/min), and temperature (102.0 °F) were within normal limits with the exception of mild tachypnea. Systolic blood pressure measured by Doppler was elevated at 180 mmHg, although not considered pathologic due to the patient’s nervous temperament. A 10- lead ECG revealed sinus rhythm with one criterion for left ventricular enlargement (R wave amplitude of 2.8 mV lead II). Two-view chest radiographs showed moderate cardiomegaly (12.5 on the vertebral heart scale) with left ventricular enlargement, loss of the cranial cardiac waist, and an interstitial pulmonary pattern most pronounced in the right lung lobes (Fig. 1). Transthoracic echocardiography revealed moderate left ventricular eccentric hypertrophy (LVIDd 2.35 cm) with a fractional shortening within the reference range (37%). Turbulent blood flow with a peak velocity of 3 m/s was identified emptying into the right pulmonary artery via a tubular structure adjacent and parallel to the ascending aorta. Transesophageal echocardiography (TEE) and cardiac catheterization were performed to further investigate the transthoracic echocardiographic findings and to determine if transvascular occlusion was a realistic option for treatment. The patient was premedicated with hydromorphone (0.1 mg/kg), induced with midazolam (0.2 mg/kg) and etomidate (1 mg/kg), and maintained under general anesthesia with isoflurane. TEE images confirmed the presence of an anomalous vessel adjacent and parallel to the ascending aorta with turbulent flow that entered the right pulmonary artery (Fig. 2). The origin of the anomalous vessel was more clearly seen arising just above the level of the aortic valve leaflets with TEE compared to transthoracic views. Left-sided cardioangiography was performed via the right carotid artery. Four mL of non-iodinated contrast12 were injected into the left ventricle through a 4 Fr Halo angiographic catheter.d Partial opacification of the anomalous vessel was seen and a second angiogram was performed at the aortic root confirming left-to-right shunting from the anomalous vessel into the markedly enlarged right pulmonary artery (Fig. 3 Video 1). Right heart catheterization was performed via the right jugular vein and intracardiac pressures were measured via a 4 Fr Berman angiographic catheter.e No systolic pressure gradient was measured between the main pulmonary artery (15 mmHg) and the right ventricle (17 mmHg), and an attempt to compare right and left pulmonary arterial pressures was unsuccessful. A right ventricular injection of 4 mL of contrast revealed normal opacification of the main, left, and right pulmonary arteries indicating normal bifurcation and origin of the pulmonary arteries from the main pulmonary artery (Fig. 3 Video 2). Figure 1 Lateral and dorsoventral radiographs at presentation showing left ventricular enlargement (VHS 12.5) and pulmonary vascular overcirculation, worse in the right caudal lung fields. (A) Two-dimensional image showing the anomalous vessel adjacent and parallel to the aorta in short axis. (B) Color flow Doppler interrogation showing turbulent flow within the anomalous vessel and the right pulmonary artery and laminar flow within the aorta and main pulmonary artery. (C) Two-dimensional image showing the anomalous vessel in long axis coursing parallel to the aorta, which is out of plane in this view. (D) Color Doppler interrogation in long axis reveals turbulent flow within the anomalous vessel and the right pulmonary artery. Ao, aorta; AOV, aortic valve; RV, right ventricle; PV, pulmonic valve; MPA, main pulmonary artery; RPA, right pulmonary artery. c Optiray 320®, Mallinckrodt Inc. St. Louis, MO. d 4 Fr Halo Angiographic catheter, AngioDynamics Inc., Queensbury, NY. e 4 Fr Berman Angiographic catheter, Arrow International, Reading, PA.
(B) Still angiogram following right ventricular injection showing contrast within the main (MPA), left (LPA), and right pulmonary arteries (RPA). Opacification of the left and right pulmonary arteries ruled out aortic origin of the right pulmonary artery (AOPA). See also Videos 1 and 2.
f Toshiba Aquilion 64 CT, Toshiba America Medical Systems Inc., Tustin, CA. g Isovue 370, Bracco Diagnostics, Princeton, NJ USA. 1.4 kg following surgical ligation and has remained asymptomatic without medication. Septation of the truncus arteriosus to form the aorta and main pulmonary artery involves fusion of the conotruncal ridges, of which several theories of embryogenesis exist.1 The right and left sixth aortic arches then join the main pulmonary artery to become the right and left pulmonary arteries.1 A spectrum of defects between the ascending aorta and pulmonary artery results from abnormal development in this area. Incomplete fusion of the distal aorto-pulmonary septum results in an aortopulmonary window. Additional defects allowing communication between the ascending aorta and the pulmonary circulation include truncus arteriosus, anomalous origin of one of the pulmonary arteries from the aorta, or an aberrant vessel connecting the great vessels. The anomalous vessel courses parallel to the ascending aorta to its junction with the right pulmonary artery. 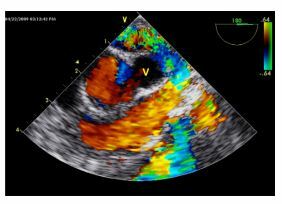 Figure 5 Transesophageal color Doppler echocardiographic image, in the same orientation as Fig. 2A and B, during thoracotomy with occlusion of the anomalous vessel (V) and cessation of turbulent flow. Laminar flow is still seen within the aorta and right ventricular outflow tract. 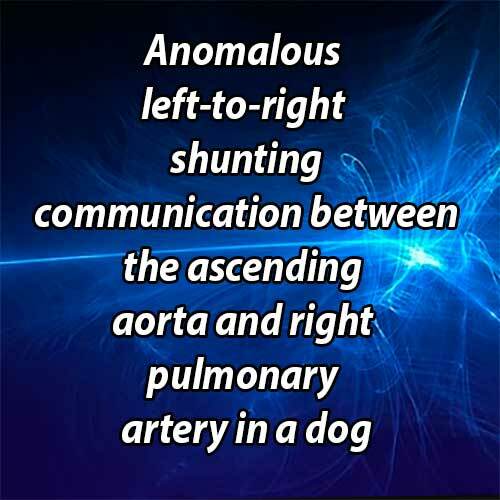 Reports in veterinary medicine of anomalies of aortopulmonary septation are limited. Few case reports of aorto-pulmonary windows in dogs or cats8-12 and one case report of a persistent trun- cus arteriosus in a cat13 have been published. There has been one case report of an aortopulmonary window in a 4-day-old foal.14 There are two additional reports of dogs with an aberrant branch of the bronchoesophageal artery that resembled a left-to-right PDA.15,16 Aortopulmonary windows, including anomalous origin of the right pulmonary artery from the aorta, produce similar pathophysiologic effects to those seen with a left- to-right PDA. In the human literature, surgical correction of aorto-pulmonary windows and AOPAs is recommended and several surgical techniques have been developed with favorable long-term outcome in cases with normal pulmonary vascular resistance.17 Closure of an aorto-pulmonary window in veterinary medicine has not been reported most likely due to the high financial cost and limited availability of cardiopulmonary bypass. The case presented is unique in that although the physical examination was suggestive of a left-to- right PDA, the radiographic and echocardiographic findings of segmental pulmonary overcirculation and turbulent flow exiting the ascending aorta were more suggestive of an aorto-pulmonary window or AOPA. However, cardiac catheterization and car- dioangiography determined the lesion in this dog was not typical of a classic aorto-pulmonary window or AOPA. In the normal dog, no artery or vessel would be found in that location during embryogen- esis to have an aberrant course to the right pulmonary artery and therefore the authors presume this vessel represents anomalous septation of the aorta and pulmonary trunk. This connection may be a variation of an aorto-pulmonary window in which the window is a tubular vessel rather than an open connection between the two major arteries. Coronary artery fistulas have been described in humans18 and although the described echocardiographic and cardioangiographic findings are not consistent with this lesion, it cannot be excluded from the list of differential diagnoses. Left and right angiograms were necessary to rule out an anomalous origin of the right pulmonary artery from the aorta which dramatically changed the potential for surgical or transcatheter occlusion of the vessel. Surgical correction of a right AOPA would require either cardiopulmonary bypass to reposition the origin of the right pulmonary artery or an attempt at complete removal of the right lung and its associated pulmonary vasculature. On the other hand, an anomalous connection between the ascending aorta and right pulmonary artery had the possibility of occlusion by a vascular plug via transcatheter approach or surgical ligation via thoracotomy. The contrast-enhanced CT performed yielded threedimensional reconstruction of the heart and great vessels in which the anomalous vessel is visible between the aorta and pulmonary artery, increasing the suspicion that the vessel may be accessible for surgical ligation. In addition, comparison to threedimensional CT reconstructions and CT still images of a typical left-to-right PDA acquired at OSU delineated the difference in location of the shunting connections and excluded a left to right PDA from the differential list. The owner made the decision to proceed with thoracotomy with the knowledge that the patient’s long-term prognosis was poor without successful closure of the vessel, despite the high risk of intra-operative complications and unknown postoperative prognosis. 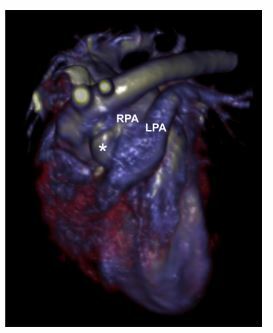 This case demonstrates that while rare, anomalous connections between the aorta and pulmonary arteries should be included in the differential diagnosis of left-to-right PDA and that cardioangiography and contrast-enhanced CT greatly facilitate the diagnosis and possible correction of such defects. Webb S, Qayyum SR, Anderson RH, Lamers WH, Richardson MK. Septation and separation within the outflow tract of the developing heart. J Anat 2003;202:327-342. Richardson JV, Doty DB, Rossi NP, Ehrenhaft JL. The spectrum of anomalies of aortopulmonary septation. J Thor Card Surg 1979;78:21-27. Elliotson J. Case of malformation of the pulmonary artery and aorta. Lancet 1830;1:247-251. Gross RE. Surgical closure of an aortic septal defect. Circulation 1952;5:858-861. Fraentzel O. Ein fall von abnormer Communication der Aorta mit der Arteria pulmonalis. Virchows Arch (Pathol Anat) 1868;43:420-429. Amer RM, Shumacker HB, Klatte EC. Origin of the right pulmonary artery from the ascending aorta. Circulation 1961;24:662-668. Report of a surgically corrected case. Prifti E, Bonacchi M, Murzi B, Crucean A, Leacche M, Bernabei M, Bartolozzi F, Nathan N, Vanini V. Anomalous origin of the right pulmonary artery from the ascending aorta. J Card Surg 2004;19:103-112. Eyster GE, Dalley JB, Chaffee A, Beadle R, Trapp A, Christopher WJ. Aorticopulmonary septal defect in a dog. J Am Vet Med Assoc 1975;167:1094-1096. Nelson AW. Aorticopulmonary window in a dog. J Am Vet Med Assoc 1986;188:1055-1058. Guglielmini C, Pietra M, Cipone M. Aorticopulmonary septal defect in a German Shepherd dog. J Am Anim Hosp Assoc 2001;37:433-437. Margiocco ML, Domenech O, Bussadori C. Finestra aortico- pulmonare in un pastore Tedesco (Aortopulmonary window in a German shepherd dog). Veterinaria 2003;17:27-32. Will JA. Subvalvular pulmonary stenosis and aorticopulmonary septal defect in the cat. J Am Vet Med Assoc 1969;154: 913-916. Chuzel T, Bublot I, Couturier L, Nicolier A, Rivier P, Mai W, Cadore JL. Persistent truncus arteriosus in a cat. J Vet Cardiol 2007;9:43-46. Valdes-Martinez A, Eades SC, Strickland KN, Roberts ED. Echocardiographic evidence of an aortico-pulmonary septal defect in a 4-day-old thoroughbred foal. Vet Radiol Ultrasound 2006;47:87-89. Malik R, BellengerCR, HuntGB, Church DB, Allan GS. Aberrant branch of the bronchoesophageal artery mimicking patent ductus arteriosus in a dog. JAHA 1994;30:162-164. Yamane T, Awazu T, Fujii Y, Wantanabe T, Muto M, Okutsu M, Wakao Y. Aberrant branch of the bronchoeso- phageal artery resembling patent ductus arteriosus in a dog. J Vet Med Sci 2001;63:819-822. Tkebuchava T, von Segesser LK, Vogt PR, Bauersfeld U, Jenni R, Kunzli A, Lachat M, Turina M. Congenital aortopulmonary window: diagnosis, surgical technique and long-term results. Eur J Cardiothorac Surg 1997; 11: 293-297. Gowda RM, Vasavada BC, Khan IA. Coronary artery fistulas: clinical and therapeutic considerations. Int J Cardiol 2006; 107:7-10.